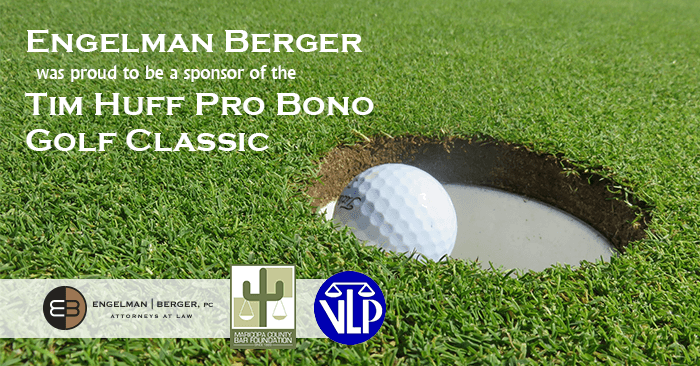 On Saturday, November 17th, Engelman Berger was a sponsor of the 2018 Tim Huff Pro Bono Golf Classic. This golf tournament benefited the Maricopa County Bar Foundation and Volunteer Lawyers Program, which supports more than 10,000 low-income families in Maricopa County who are in need of civil legal services. The Volunteer Lawyers Program was founded through the Maricopa County Bar Foundation in 1993. Tim Huff’s mission was to create a Pro-Bono option for community members who were desperately seeking legal assistance but were unable to afford it. So far, this Pro-Bono option has been benefiting low-income families for over 25 years and providing them with the legal assistance and service they are seeking. Through VLP, more than 5,000 people a year get free family law advice from volunteer lawyers; over 200 children annually have volunteer lawyers speak on their behalf in family court as well as over 300 families who cannot afford legal help; and, the VLP also provides legal advice and reassurance to seniors who are intimidated by debt collectors. We hope everyone who attended had a wonderful time participating, offering legal advice and assistance, and helping the community!